On 12 December, the vessel called at Hamburg, entry port for North Europe but also for servicing the Baltic and Russia. Due to its location, Hamburg is the preferred port for access to German markets inland, but also, thanks to a network of feeders operated by the Group, for seamless onward transport to all Scandinavian, Baltic and Russian markets. Russia is fast becoming one of the leading north European destinations for our services from Asia. The biggest vessels are treated to an even more solemn ritual on their arrival into and departure from German territorial waters: in addition to the flag ceremony the national anthem of the country under which the vessel is registered is played. In total, 152 anthems are recorded on the central station’s computer and this tradition is scrupulously honoured by shipping enthusiasts and experts who take turns to ensure it takes place every day of the year between 08:00 and 20:00. 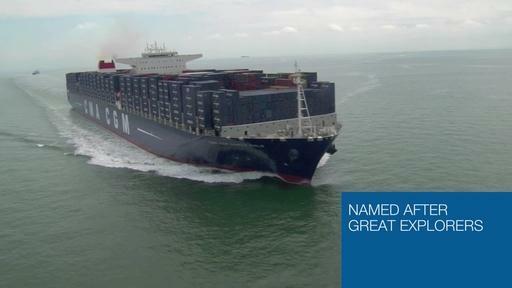 You can find out more about the call of the CMA CGM Marco Polo by reading this article of Bild.de.